Mike, Myra-Jean, and I went to the Atwater Farmer’s Market this morning for our habitual pupusa run. It was a beautiful day, and MJ was in fine spirits, wearing a particularly fetching, even stylish outfit — chosen all by herself — a black and white houndstooth jacket, wide legged black pants, and a pink and green hand-knit sunhat. A well-dressed kid on the east side of L.A. is about as notable as a screenwriter in Santa Monica, but MJ is an interesting case, as her mother — I — could not be less fashion-conscious. As in, I will be buried in jeans and a tee shirt. So in this case, our little apple — sartorially speaking — has fallen so far from the tree as to be, well, an orange. Lucky for her, and fun for us. At the market she got her face painted like a blue cat, and the look was complete. I digress. Back to the drummers. MJ loved them, and danced along for quite some time, hat pushed back, houndstooth glinting in the sun, feline features deeply concentrated on keeping the beat. Which she didn’t. Still, it was adorable. Then the dancing stopped, and the troupe’s leader, a bespectacled, bookish-looking fellow wearing the closest thing to a loincloth I’ve seen outside of the Natural History Museum, made a speech. It was about farmer’s markets, and farmers, how they are saving the earth, and how we must all “love our Mother.” When he said that last bit he reached down and touched the “earth.” Except the earth was the sidewalk of Glendale Boulevard. He did this a number of times. I found it depressing. I almost wished he’d brought a little pile of dirt with him, as touching the sidewalk was only reminding all of us of how far from any kind of real “earth” we were. It made me want to go home and get back to the terraces, where I may not have earth per se, but I can at least reach down and touch clay. And paperwhite corpses. And gypsum, which might contain earth-like elements, or at least feels earthy if you close your eyes. 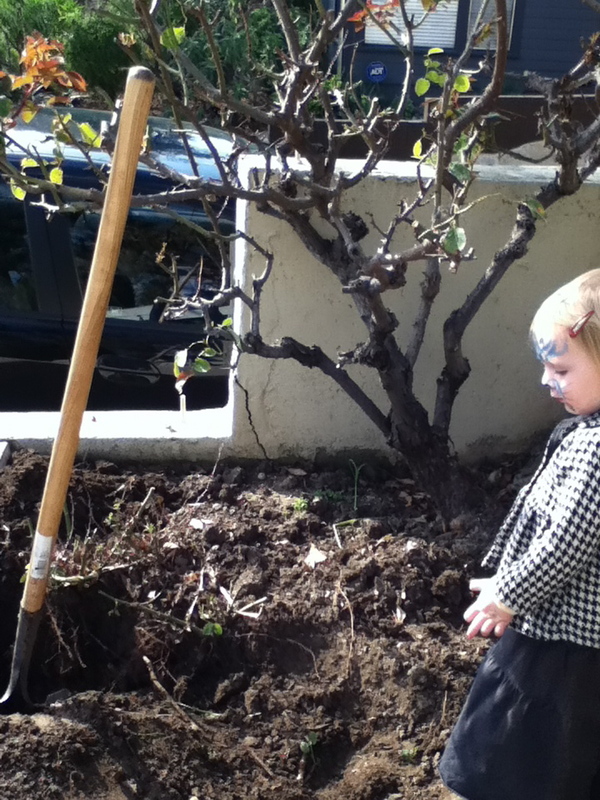 An hour later, the small rose bush is almost dug up. The yard is swept. The yard waste bin is full. MJ has shed her clothes (and had her “face” wiped off) and gone to bed. She is tired from her morning’s exertions. I hope she will dream of drums, dancing, pupusas, and lots and lots of earth. Or clay. Or even, I suppose, the sidewalk on Glendale Boulevard, which is not Mother Earth but is not NOT her, either. Mike and I are quiet in the house. Enough has been done for one day. We’re a funny little tribe, but we’re happy. This entry was posted in childcare, cooking, Garden, household and tagged atwater farmers market, face paint, fine spirits, glendale boulevard, houndstooth jacket, little apple, natural history museum, pupusas, saving the earth on December 18, 2011 by thumbstumbler. This one was not dark, not dry, not particularly funny, but it was beautiful. What a sweet thing: Wondering if your little girl is dreaming of Native Americans, drums and Mother Earth. Speaking of your own “funny little tribe” Happy. That may be one of the only things I’ve ever read that actually made domesticity, parenthood and marriage sound appealing.